FOR PONY! – Harley Hair Extravaganza! 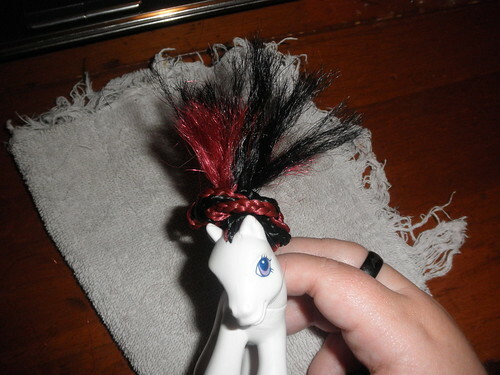 Having finally finished rehairing the mane of a small My Little Pony (formerly a McDonald’s Happy Meal Toy) I have been playing around with different styles for my Harley Quinn pony. It is actually perfect for this, since it had a double row of plugs that made putting two different colors relatively easy. I could just use modeling putty to make her jester’s cap, but I wanted to see what a two color mane would look like and if I could style it into something appropriately Harley. The hair in the pictures is very long, but I did it that way so I would have plenty to work with and it can be trimmed easily. I’d appreciate some feedback on what you guys think. 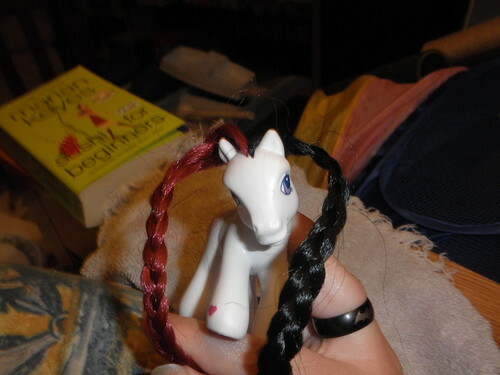 The hair I’m using is much thicker and stiffer than what is normally used for Ponies, but that might be a good thing. If I trim the mane into a pair of short braids or ponytails :snerk: they would stick up like the sides of a jester’s cap. I would probably have to add extra plugs to the center to plump them up. The same braids looped around each ear, could also be done with unbraided hair Pretty close to the shape of Harley’s jester’s cap. On a full-sized Pony it wouldn’t look so over-sized. Slightly different variation of the Leia. Slightly smaller version of the Leia. Basically the same. Another variation of the Leia, the two ends of the braids are twisted together at the back of the neck. 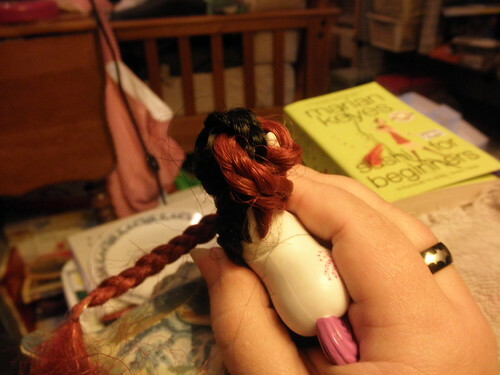 The back of the Leia Twist. A bit more Harley -esque. Plumped up with a few more plugs of hair in the middle and it would look very similar to a jester’s cap. A closeup of the Twin Twisty Buns. You can see the double row of plugs a bit clearer. A side view of the Twin Twisty Buns. You can see the sewing pins I'm using as hairpins. This one is the front runner so far, if I could get it just right it would look pretty good. After all the work it took me to put each of those tiny plugs in, I am having more fun that a woman my age should have styling the hair of a little vinyl horse. Totally worth it. 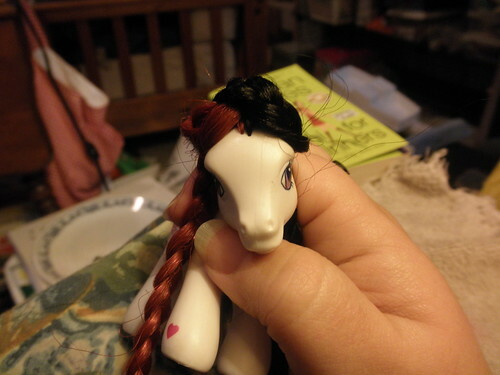 So a while back I wrote about custom My Little Ponies and that I was going to try my hand at them. With one thing and another happening in life (you know … ninjas) I have generally just fiddled around with them but I thought I would post a few update pics of my work. 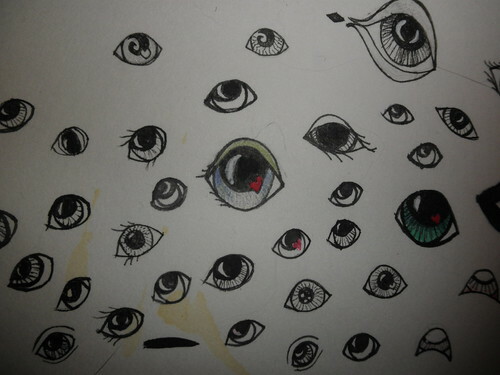 EYES – I’ve been doodling tons of eyes. Having a few Ponies at my disposal I have discovered that, for the most part, the original eyes are very simple. 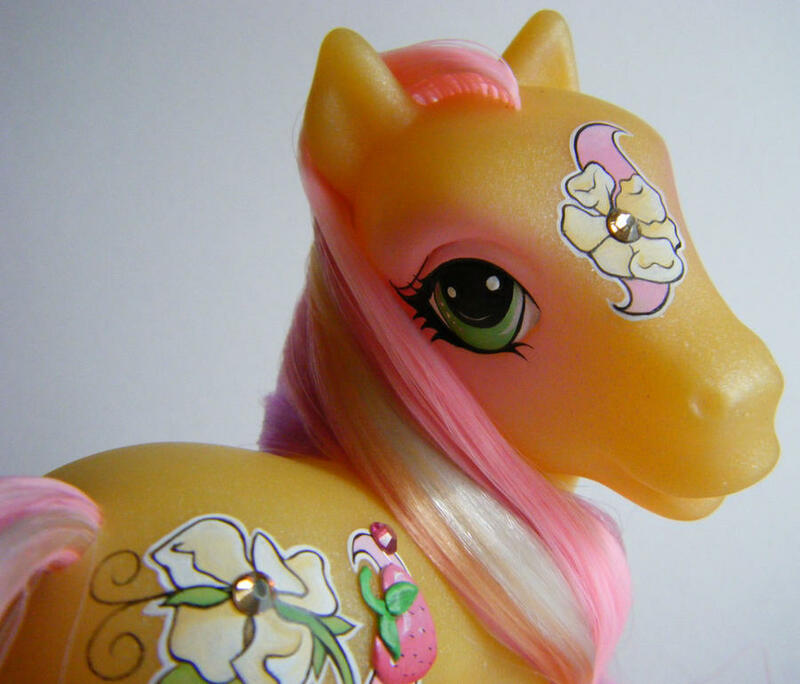 Most of the eyes I have seen on custom ponies are far more elaborate. I’m not ready to do super-fancy eyes just yet, (and I don’t much care for the overdone eyelashes and curliques) but I can do as well as the factory ones at any rate. Most customizers just use the old eye as a template and redo the colors or add embellishments. The "spray-paint-around-the-eye" look is called "pop-girl eyes". REHAIRING – I’ve been practicing rehairing with unraveled yarn, it’s slow going but not terribly difficult. I haven’t done too much practicing since I’d have to cut off the practice “hair” to put in good hair, but I’ve done enough to have the technique down. 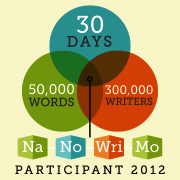 It isn’t terribly difficult, just a lot of boring repetition. 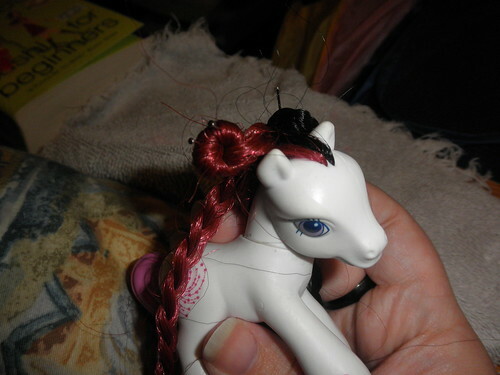 I’ve ordered some hair off of eBay; it’s artificial hair used on people to make braids and dreadlocks, so it’s not the really fine, nice stuff sold specifically for doll rehairing. Many of the fora I’ve visited has been filled with nothing but poorly-spelled rants against the stuff, but I figure it’s good enough for a few practice ponies. That said – there may be a post in the future where I curse the day I bought the stuff, but I will try to spell “hellspawned hair” correctly. 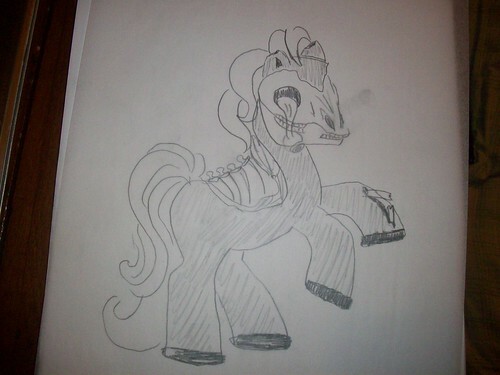 ZOMBIE PONY – I’ve gotten the head resculpt for Zombie Pony about fifty percent done. 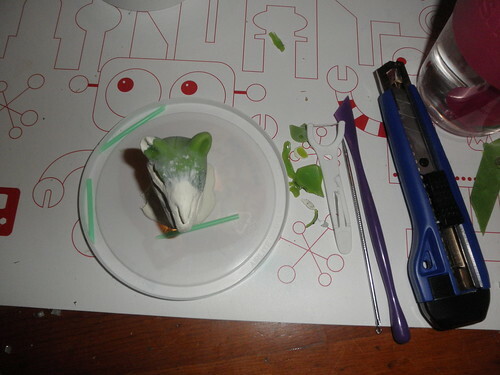 I started by cutting away most of the right side of the pony’s face, most of the muzzle, and a bit of the left side. the teeth and some jaw will be visible through the left side, but I left most of it intact since the right side will be the side primarily on display. I shaved a bit if the underside of the chin off, but left most of it to help support the skull’s weight. Here you can see the bits I cut off and some of the tools I used. The little blue-green sticks are actually cut down cotton swab stems. 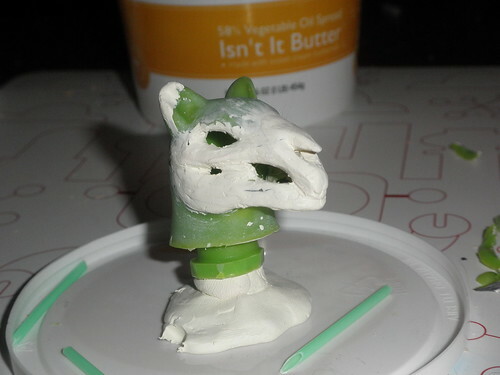 Zombie Pony pre-slicing, I used Play-Doh to map out the areas I wanted to change. 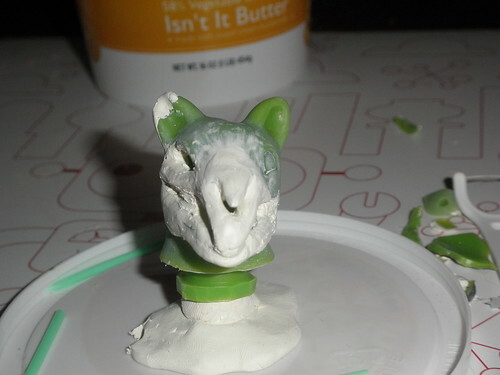 The original muzzle was fairly short and stubby, I used my modeling compound (SculpeyIII in Vanilla Creme) to extend it to get a more realistic shape to the skull. Lacking a horse skull of my own to use as a reference model, I used images Uncle Google found for me. This is a real horse skull. While not completely anatomically correct, I’m pretty pleased with the results so far. Once the head is sculpted, I need to resculpt the left leg (I’m going to make it look broken and have a bone sticking out) and add a few protruding vertebrae to the spine area. Next I need to cure the bits of Sculpey, add weight to the back legs to keep it from tipping over from the added weight of the Sculpey skull, and then comes painting and the finishing touches. The Sculpey is proving to be very persnickety, I may scrape it off and start over with Milliput. The Sculpey is just cracking so much I’m worried it will fall apart before I can cure it. Better to redo it now then have to try to fix it later. I might choose another victim from the Bait Pony Bucket and use Zombie Pony as a model.I’m thinking a bigger Pony, since Zombie Pony is a baby, then I can have a little zombie family. The Bait Pony Bucket. Is there a future Zombie Momma in here? 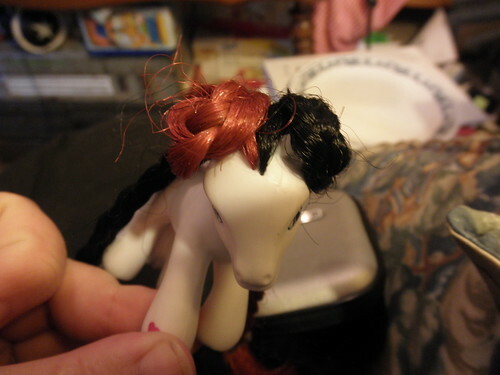 OTHER PONIES – Darkwing Pony and Harley Pony are still in the planning stages. I will probably do Harley next since she will have fewer accessories that will need to be sculpted. I’m still mulling over the idea of giving her a dual-color mane and tail (dark red and black), just doing a dual-color tail, or doing without hair all together since the character wears a full body suit and doesn’t actually have any visible hair to replicate. I really never thought I’d have this sort of problem. Life is a strange thing sometimes. 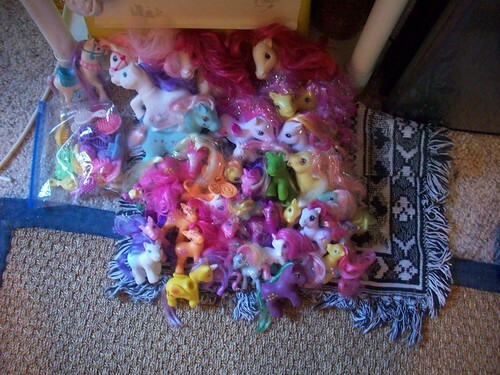 I recently bought another lot of loose ponies at a yard sale, bringing my total pony count to over a hundred. That’s a lot of ponies. Many are in sad condition, with snarled hair and damaged bodies, from constant play. Quite a few are in pretty good condition, most from the last lot I bought. 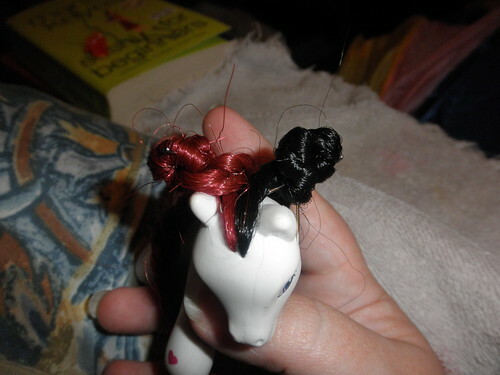 The girls who owned these Ponies took care of their stuff. The hair is a bit tangled, but I have some ideas on how to clean them up. Zombie Pony and one of the crazy-hair Ponies. Mother Dearest has recently opened up a store on eBay and has offered to list some of the Ponies that are in better condition. She’s only going to charge me a 75% fee 😉 (I’m almost sure she’s joking.) I’ll do a separate post on those once I get around to fixing the hair on them. I figure since I paid about fifteen to twenty cents for each Pony, if I sell a few of the nicer ones on eBay for a couple of dollars I can use that money to buy good hair and sculpting stuff. And more ponies, of course. 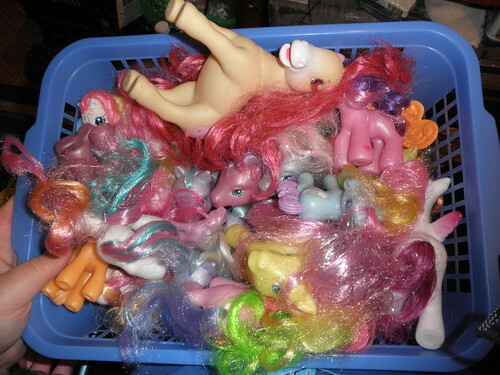 A basketful of crazy-hair Ponies ready for refurbishing. 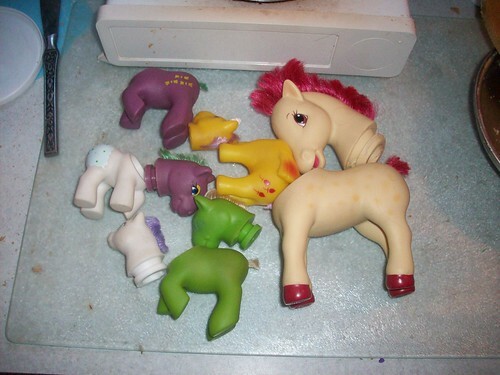 Several dismembered and dehaired bait Ponies ready for working. The little white one is the one I've been sketching out Harley on, you can see the mask and some of the lines for her body suit. In fact, I love them. On Saturday when we were heading to lunch, we saw a big community yard sale in the local elementary school parking lot. It was early afternoon so many people were starting to pack up, but we decided to stop and take a look. 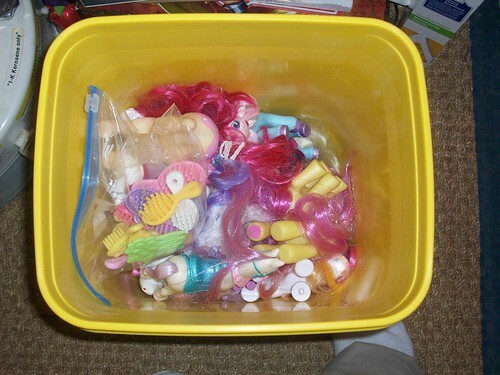 A bin filled with My Little Ponies. I bought the whole thing for five dollars, forty of the wee beasties in all. I’m so glad you asked that, imaginary reader. 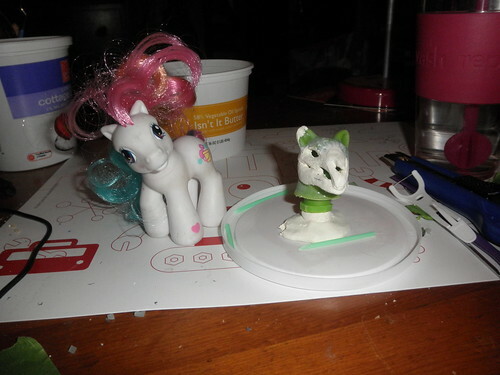 Welcome to the weird and wonderful world of customized My Little Ponies. 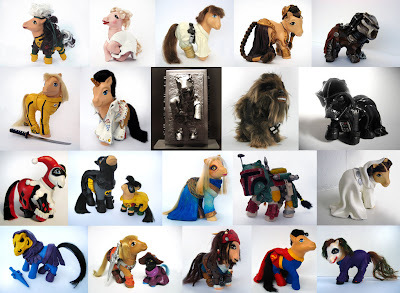 Why yes, that IS a My Little Pony frozen in carbonite. I have been looking at these little babies online for a while now and I have been itching to try my hand at it, but I did not want to pony up (snerk) the five bucks to buy a new one. You can find Ponies in fair but not collectible condition (know as “bait” or “bait ponies”, I’m not sure why.) on eBay, but I wasn’t looking to spend that much either. Thank the stars that some unknown local girl decided to clean out her toy box. 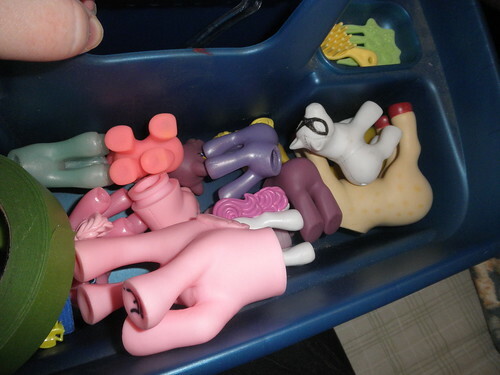 I have sorted the Ponies into fakies (non-MLPs), MLPs from Happy Meals, and full-sized toys. I have already prepared a few of the fakies and I’m sketching up some designs for them. 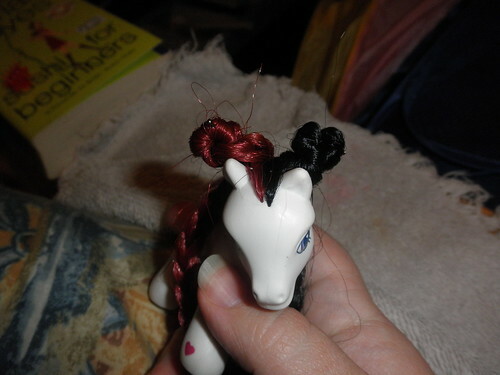 Step one was to decapitate the pony if possible and cut the manes and tails off. 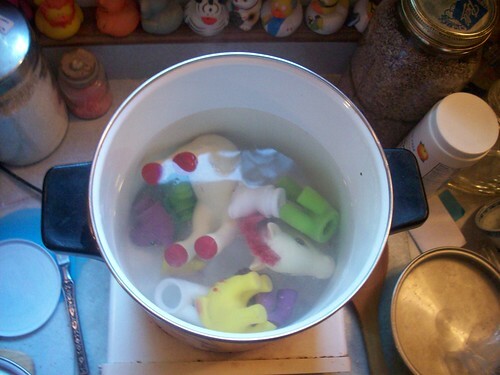 Step two was to boil the ponies to loosen the glue holding the manes and tails in. This is easily the oddest thing I've done this week. 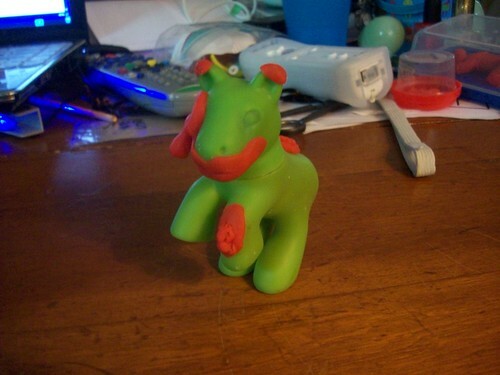 I have already chosen my first test subject – the little green pony. 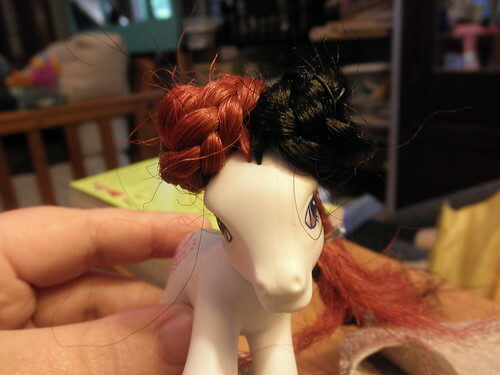 I think it will make an excellent zombie pony.